Parker re-signed Friday with the Sky on a multi-year contract. Parker will return to Chicago for her fifth season with the team after breaking out with averages of 10.0 points, 5.8 rebounds and 1.0 block in 19.7 minutes per game, all of which were career highs. The forward also flashed more aptitude beyond the arc in 2018 (six makes on 19 attempts) after going 0-for-4 from three-point range in her first three seasons. Parker should be in contention for a starting role alongside the triumvirate of Courtney Vandersloot, Diamond DeShields and Allie Quigley. Parker registered 12 points (5-7 FG, 0-1 3Pt, 2-2 FT), three rebounds, two assist and one steal in Sunday's 97-92 loss against Indiana. This was Parker's third straight outing reaching double figures, as she dropped 12 points on a superb 71.4 percent mark from the field Sunday. 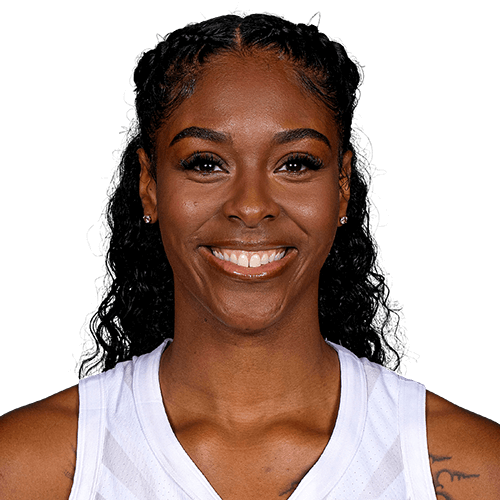 The Middle Tennessee State product wrapped up her fourth WNBA season with career highs in points and rebounds with 10.0 and 5.8, respectively. Parker registered 10 points (4-6 FG, 0-1 3Pt, 2-3 FT), nine rebounds and four blocks in the Sky's 101-87 win over host Phoenix on Wednesday. Parker was once again the team's leading rebounder Wednesday, as she hauled in nine rebounds while also adding a decent four blocked shots. The 26-year-old is currently leading the Sky in both categories with 6.3 rebounds and 1.2 blocks per outing in 2018. Parker posted 14 points (5-6 FG, 2-3 3Pt, 2-4 FT), three rebounds and one block during Sunday's 93-76 blowout loss versus the Sparks. After a four-game absence, Parker managed to score in double figures, dropping 14 points on a near perfect five-of-six shooting performance from the field Sunday. Through 25 games played so far in 2018, the 26-year-old Middle Tennessee State product is adding 9.8 points and 6.2 rebounds per outing, both of which are career bests. Parker managed 13 points (3-6 FG, 7-8 FT) and four rebounds in the 97-94 loss against the Liberty on Sunday. Despite fouling out in 23 minutes of action, Parker still came away with 13 points with more than half of them coming at the free-throw line. The fourth-year forward is currently posting a career season while averaging 10.8 points and 6.8 rebounds over 16 contests in 2018. Parker registered nine points (4-8 FG, 1-2 FT), 10 rebounds and one assist during the Sky's 81-72 loss to the Sparks on Sunday. Parker missed what would have been her fifth straight game in double-figures and her third consecutive double-double by just one point Sunday. The 26-year-old has vastly improved during her fourth season in the league thus far and is averaging career-bests with 10.9 points, 8.0 rebounds and 0.6 assists per outing. Parker had 17 points (6-10 FG, 0-1 3Pt, 5-6 FT), 12 rebounds and two blocks in Sunday's 77-59 blowout loss at Los Angeles. Parker was pretty much the only player to show up for the Sky on Sunday, as she led the team by a wide margin with 17 points on 60 percent shooting while grabbing 12 rebounds to mark her second double-double of the year. The former Middle Tennessee State star has now strung together four consecutive games scoring in double figures while also adding eight rebounds per game over the stretch. Parker added 20 points (9-15 FG, 0-1 3Pt, 2-2 FT), 13 rebounds, three steals and two blocks during the Sky's 95-90 victory over the Aces on Sunday. Across 30 minutes off the bench, Parker erupted for 20 points, as she knocked down 60 percent of her field-goal attempts while adding a season-high 13 rebounds. The 26-year-old, fourth-year forward has vastly improved her game so far in 2018 and is currently averaging a career-high 10.3 points and 7.3 rebounds per outing. Parker amassed 10 points (3-6 FG, 4-6 FT) and eight rebounds in Saturday's 82-64 win over the Fever. In only 12 minutes, Parker had a strong performance off the bench Saturday as she narrowly missed a double-double by two rebounds. The 25-year-old though will likely continue to come off the bench for most of the season but may end up seeing a switch if she can score and rebound at a consistent, high rate. Parker recorded 13 points (4-10 FG, 1-2 3Pt, 4-4 FT), eight rebounds and one assist during the Sky's 78-61 preseason loss to the Dream on Sunday. Parker lead all Sky scorers Sunday while shooting 40 percent from the floor and adding a game-high eight rebounds. The 25-year-old begins her fourth WNBA season looking to improve her scoring ability, as she has averaged under 4.0 points in each of her first three years with the Sky. Made her WNBA debut on June 5 against Indiana and had eight points (career high) and four rebounds in 12 minutes of action…Set a career high in rebounds with seven against Washington on 8/2…Averaged 9.3 minutes per game and played in 30 of 33 games…Averaged 2.2 points and 2.5 rebounds per game over the course of the season. Played for China’s Henan Yichuan of the WCBA…Started at forward and led the league in rebounds per game (14.1) while placed in the top three in points (26.1) and blocks (1.5) per game…Named a 2016 WCBA all-star…Led Henan to the playoffs with 10-2 record.